Grilling out often can get boring though. Seriously, how many hot dogs and hamburgers can one eat? A great alternative is to include some sausage options into your routine. Johnsonville has some “new hot products offerings including Firecracker Brats with spicy peppers, Chipotle and Monterey Jack Brats, and Cheddar and Bacon Grillers – sausage patties with extra ingredients designed to be a more flavorful alternative to the typical hamburger”. Makes you hungry, right? 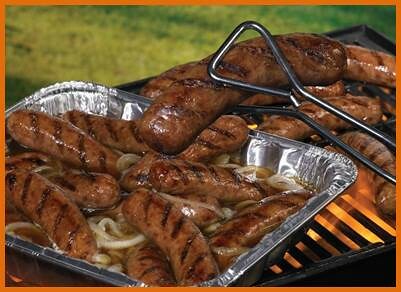 The line of sausages and brats from Johnsonville provides your favorite grill-master with lots of options to get creative this summer. While we haven’t been grilling outside, our indoor grill has been heating up some delcious smoked sausage brats with swiss, apple chicken sausage (with 50% less fat), and the always delcious brat. As a kid, I probably shied away from these meats, but I can tell you that my kids will put a hurting on someone who tries to take away theirs. That’s a sure sign of a quality meat! If you are still looking to finish up your 4th of July menu, might I suggest this incredible recipe that was shared with me (and that I cannot wait to put on the grill this weekend – sunshine is in the forecast, ‘burghers!). Serve immediately and place any remaining brats into the steaming hot tub. This entry was posted in Dinners, Product Reviews. Bookmark the permalink.